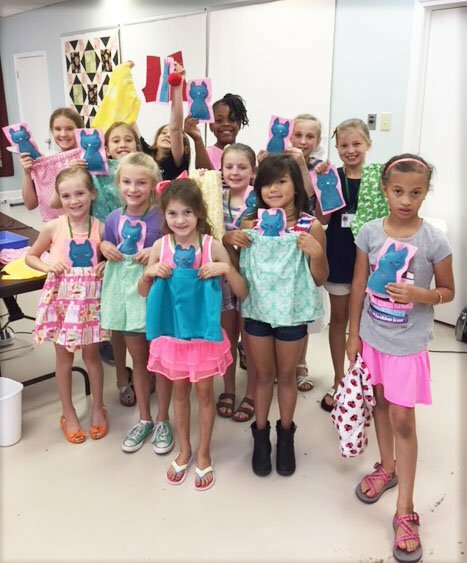 Campers will learn basic sewing skills including how to thread a sewing machine and wind a bobbin, how to pin and cut out a pattern, how to sew straight and curved seams, how to finish seams, and how to put in a simple zipper as they complete several beginner-level projects. Price includes materials for projects, use of classroom sewing machine, use of classroom sewing supplies, and healthy snack each afternoon. Payment is required to complete the registration. Cancellations 2 weeks or more prior to camp will be given a full refund. Cancellations less than 2 weeks in advance but prior to first day of camp will receive a full refund if the spot can be filled from a wait list. Otherwise, refund will be of ½ of camp fee only, in the form of a store credit. No refunds or credits can be issued once camp has begun. Please give us a call at 501 227-0288 or come by the shop to register. Price includes materials for projects, use of classroom sewing machine, use of classroom sewing supplies, and healthy snack each afternoon.